The current competition runs until 4 July (UK only I'm afraid): win a copy of The Library of Shadows by Mikkel Birkegaard, donated by the translator Tiina Nunnally. and Norman Price reviews Gallows Lane by Brian McGilloway saying that the main character is "a successor to Rebus and Morse". 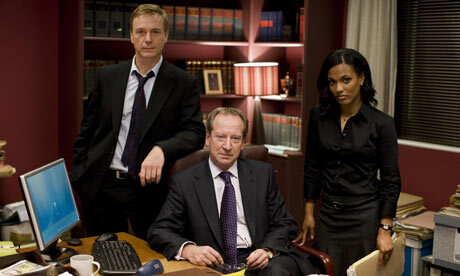 ITV1 has commissioned Law & Order: UK for a 13-episode second series, it has announced. The first series, starring Freema Agyeman, Jamie Bamber and Bradley Walsh, opened its seven-episode run with strong ratings earlier this year. The second half of the series is yet to air. Series two will see the return of the original cast and will go into production later this year. "This new commission brings our total order to 26 episodes, which demonstrates our commitment to series that have concepts and storylines that can run long-term," said ITV's Laura Mackie. "Audiences clearly loved the first series, which featured the cream of British acting talent with gripping 'torn from the headlines' storylines, and this will again be at the heart of the new series." The ITV1 website is here. The Guardian coverage is here. HarperCollins has bought additional books from author Jessie Keane. Publishing director at HarperFiction Wayne Brookes bought UK and Commonwealth rights to three Keane novels from Judith Murdoch for “a good six-figure sum”. The first book is due in 2010. The Euro Crime bibliography for Jessie Keane is here. I haven't read any of her books but the covers are Martina Cole-esque. Agatha Award-nominated author of A BEAUTIFUL BLUE DEATH Charles Finch's next two mysteries set in Victorian London and featuring Charles Lenox, to Charles Spicer at Minotaur, by Kate Lee at ICM (NA). Charles Finch's Euro Crime page is here. A new competition is now up and running (UK only I'm afraid). Win a copy of The Library of Shadows by Mikkel Birkegaard, donated by the translator Tiina Nunnally. and Laura Root reviews The Bloomsday Dead by Adrian McKinty. Neil Cross, author of NATURAL HISTORY and BURIAL has had a new crime show, LUTHER, commissioned by the BBC - to be aired in 2010. Read the Euro Crime review of Burial. Last Thursday's Simon Mayo's Book Review show featured Peter James and his latest book Dead Tomorrow. You can listen again or download the podcast at the BBC website. Read the Euro Crime review of Dead Tomorrow. I've listened to the Mayo & Kermode film review podcast from 5 June and Kermode's film of that week was French thriller, Anything For Her. There is to be a US remake called The Next Three Days. Our other notable trip out during our time-off work was to the David Austin Roses Plant Centre at Albrighton (Wolverhampton). The roses are not only beautiful but many have that gorgeous old fashioned rose scent. and Euro Crime reviewer "Pat Austin"
We ended up buying a Queen of Sweden which has a beautiful shaped pink rose with a light scent and a Jude the Obscure which has yellow flowers with the most strong smell, lovely. The winners will be announced at Bouchercon at Indianapolis in mid October. Kerrie's poll on 'which of the International Dagger shortlist have you read' closes in two days. The joint leaders on her poll are The Girl Who Played with Fire and Echoes From the Dead. Over here on Euro Crime, there's a close battle being fought for 'the title people want to win' between The Girl Who Played with Fire and The Redeemer with both hovering around the 30% of the vote mark. However on the poll for 'which do you think will win', the outright leader is The Girl Who Played with Fire with a massive 56% of the votes. These two polls will run until 14th July. So as not to dilute the Euro Crime blog any further with more off topic postings, I've set up a blog called (tentatively) Teenage Fiction for All Ages (though the blog url is readingteenagefiction.blogspot.com) where I can post about the teenage (YA) books I've been reading recently. I shall copy a few older posts off this blog but then it will be new stuff. I don't think it will be updated as often as this one and cats and Doctor Who will still figure from time to time on this blog :). Vish Puri, founder and managing director of Most Private Investigators Ltd., sat alone in a room in a guesthouse in Defence Colony, south Delhi, devouring a dozen green chili pakoras from a greasy takeout box. Puri was supposed to be keeping off the fried foods and Indian desserts he so loved. Dr. Mohan had "intimated" to him at his last checkup that he could no longer afford to indulge himself with the usual Punjabi staples. "Blood pressure is up, so chance of heart attack and diabetes is there. Don't do obesity," he'd advised. Puri considered the doctor's stern warning as he sank his teeth into another hot, crispy pakora and his taste buds thrilled to the tang of salty batter, fiery chili and the tangy red chutney in which he had drowned the illicit snack. He derived a perverse sense of satisfaction from defying Dr. Mohan's orders. Still, the fifty-one-year-old detective shuddered to think what his wife would say if she found out he was eating between meals -- especially "outside" food that had not been prepared by her own hands (or at least by one of the servants). Keeping this in mind, he was careful not to get any incriminating grease spots on his clothes. And once he had finished his snack and disposed of the takeout box, he washed the chutney off his hands and checked beneath his manicured nails and between his teeth for any telltale residue. Finally he popped some sonf into his mouth to freshen his breath. All the while, Puri kept an eye on the house across the way and the street below. Read the rest of the extract on the Simon & Schuster website. and Norman Price reviews The Jerusalem File by Joel Stone. I've updated the Euro Crime News page for this week. It's hosted on FriendFeed. No registration is required - it's just a page of links, like the old format, but is easier for me to keep up to date. Visit it here. A reminder that if you like that, you'll love our crime and mystery room - here - where, if you do register with FriendFeed, you can add links and 'chat' with equally devoted crime fiction fans. Amazon have emailed today to say that the second Professor Layton DS game is now available to "pre-order". The UK title may be Professor Layton and Pandora's Box with the US title currently listed as Professor Layton and The Diabolical Box. I believe this is actually a prequel story-wise to Professor Layton and the Curious Village but with an increased variety of puzzles and more video clips. The US release date is 24 August, the UK is 25 September. 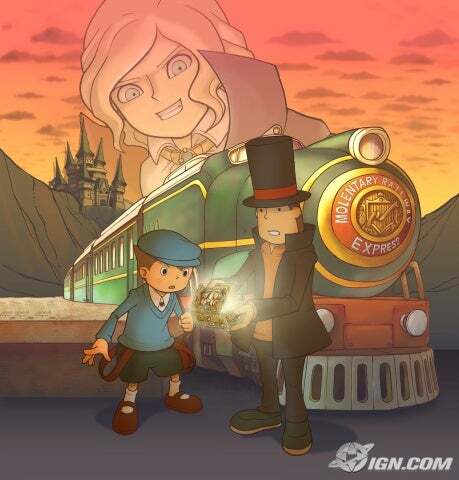 Synopsis: In the world of Professor Layton, puzzles hide in every corner. When the professor's mentor is mysteriously murdered, a cursed artefact called the Elysian Box appears to be behind it. With a ticket to the Molentary Express as their only lead, Professor Layton and Luke embark on an adventure that will test their wits and work their brains. Calling all brainteaser fans! With tons of in-game puzzles of different types and difficulties, there's something for everyone from kids to adults. As Professor Layton, you'll open doors with sliding puzzles, uncover clues with logic puzzles, and find answers by solving riddles. A cinematic experience! This large-scale sequel to Professor Layton and the Curious Village™ features three times the voiced dialogue and movies of its predecessor. The fully voiced movies, hand-drawn art style, and cast of eccentric characters bring the story to life and are sure to charm puzzle fans young and old. I spotted these new editions with Julia McKenzie on the cover in Borders yesterday. According to Wikipedia, the four new episodes of Marple will be shown in the US in July: A Pocketful of Rye (5 July), Murder is Easy (12 July), They Do it With Mirrors (19 July) and Why Didn't They Ask Evans? (26 July). No UK transmission dates have been announced yet. As usual the casts are fabulous. (eg Helen Baxendale, Rupert Graves, Matthew Macfadyen and Prunella Scales in A Pocketful of Rye.) The Region 1 DVD will be available on 4 August. The other day I set up a poll for 'which title people think will win the International Dagger'. The comments have indicated that the answer to that question is not necessarily the title that they themselves want to win. So I've sent up a second poll asking 'which title do you *want* to win'. Please vote in this new poll (and the other if you haven't done so already) and also tick which books you've read off the list in the poll on Mysteries in Paradise. I've been itching to visit the Doctor Who exhibition down in Cardiff and check out the Roald Dahl Plass where the "entrance" to Torchwood can be found. But daunted by the 3-4 hours travelling each way I decided a visit to the temporary exhibition at Coventry would be easier. It contains many props from the revamped series including the telescope from Tooth and Claw, staples: TARDIS, K9, Cybermen and Daleks, plus many costumes, including Donna's wedding dress and outfits from Planet of the Dead. It took me about 30 - 40 minutes to go round and was £8. The best bits for me were the Cybermen and Daleks which actually moved and spoke and were quite scary! Following on from the announcement of the shortlist for the International Dagger, Kerrie at Mysteries in Paradise has set up a poll for you to register (anonymously) which ones you've read. I've now set up a poll (top right of the blog) to see which book, people think will win. I've set it to close on 14 July, the day before the official announcement, so there's some time left to catch up on one's reading. Please do vote in both polls. Our eldest cat is too poorly to go into a cattery now so we cancelled our plans to go away and instead have two weeks at home. The plan is to do "day trips" to places, though the weather has been less than encouraging. We managed to avoid getting more than a few drops on us today though the sky was very ominous. The first trip has been to Hay on Wye. Using a combination of car/train/bus we arrived at just after 12.30pm ie time for lunch. Due to the poor scheduling between train and bus we had an hour's wait in Hereford both ways. So on arrival in Hay, we hotfooted to the Granary cafe (which now has free wi-fi access!). We were soon tucking into a delicious cashew nut roast and vegetables. Too full for cake at this point, the next point of call was Richard Booth's emporium. But...though the front has had a spruce-up, the inside was not fairing quite so well. Both the basement and the first floor were off limits thus curtailing our exploration of crime fiction (basement) and IT (first floor). This shop is where I normally pick up second-hand books from the Golden Age or unfamiliar translated books from a few years ago. A short walk through Hay's streets took us to a couple more (unphotographed) shops and then I thought I'd hit the £1 shop. All books priced at a pound irrespective of what's on the cover (or so I thought). It seems the credit crunch has hit BookEnds as well as now prices range between £1 and £3. Still a bargain but a bit of a shock when I went to pay as the shop has been £1 a book for as long as I've been visiting Hay. A couple more shops lead to no more purchases and I was beginning to worry about my 'haul' - but I hit (relative) pay-dirt in the Murder and Mayhem bookshop. This was followed by a browse of the jigsaw shop, including marvelling at 18,000 piece jigsaws. All this shopping meant it was time for a 'snack'. Then a last look at the view before catching the bus back to Hereford. Details of today's trip to Hay on Wye will be revealed in the next post. and Laura Root reviews The Murder Farm by Andrea Maria Schenkel and she "would highly recommend this unusual, thought-provoking book". I've updated the Euro Crime News page, which is currently being hosted on FriendFeed. No registration is required - it's just a page of links, like the old format, but is a lot quicker for me to update. Visit it here. Links are to recent reviews and interviews in the UK papers. If you like that, you'll love our crime and mystery room - here - where, if you do register with FriendFeed, you can add links and 'chat' with equally devoted crime fiction fans. Crime Scraps is on the case and has alerted the FriendFeed crime and mystery room of the shortlist for the CWA International Dagger which was listed in today's Times. (The website link is currently broken). The full list of possible choices and my speculations can be found here. The CWA website has the reasons behind each of the choices. To Little,Brown, two further novels by Glasgow crime writer Alex Gray. The novels, which continue Gray's series featuring Detective Inspector Lorimer and psychologist Solly Brightman, will be published in 2011 and 2012. In addition, Shelley has acquired, from Canongate, mass market paperback rights to Gray's first novel NEVER SOMEWHERE ELSE, and FIVE WAYS TO KILL A MAN. They will be published in September this year and spring 2010 respectively. Alex Gray's bibliography can be found here. Giorgio Vasta's TIME ON MY HANDS, about a group of terrorist boys in Italy in the late 70s, to Mitzi Angel at Faber, Lee Brackstone at Faber & Faber, Vincent Raynaud at Gallimard in France, Koen van Gulik at Wereldbiblioteek in the Netherlands, Monica Carmona at Mondadori in Spain, for publication in October 2008, by Lorenza Pieri at minimum fax. International art dealer and BBC Antiques Road Show regular Philip Mould's SLEUTH: Adventures of an Art Detective, tales of forgery and discovery based on the author's own experiences focusing on six paintings, including a fake Norman Rockwell, a would-be Rembrandt and a Winslow Homer that miraculously surfaced on a trash heap in Ireland -- and the eccentric characters behind their dramatic histories -- to be published in conjunction with a multi-part prime time series of the same name, to Joy de Menil at Viking Penguin, in a very nice deal, at auction, by Elizabeth Sheinkman at Curtis Brown UK. 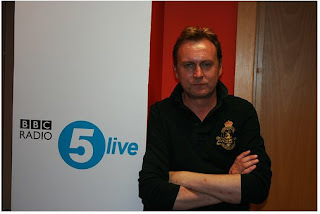 Philip Glenister was Simon Mayo's guest on Monday talking about all things Gene Hunt. If there is a third series of Ashes to Ashes then that will be the last. They discussed the US version of Life on Mars and what Philip's up to next. The number of female authors in the shortlist has doubled to two, compared to 2008's list. You can cast your vote here until 22nd July. The winner will be announced at the Harrogate Crime Writing Festival on 23rd July. An ice cream company created the purple "licence to chill" lolly after asking more than 1,000 women which male celebrity like to see on the end of a stick. Del Monte Superfruit Smoothies said artists "worked tirelessly" to recreate a sculpture of 41-year-old Craig in the scene where he emerges from the sea in Casino Royale. "Daniel Craig topped our poll of Britain's coolest celebrities and thanks to our Del Monte lolly replica he is officially immortalised as super smooth and licensed to chill," said spokesman Matt O'Connor. 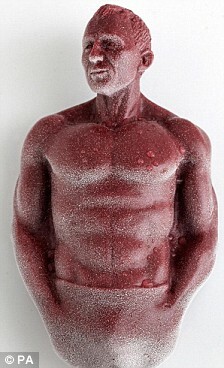 The Daniel Craig smoothie lollies are blueberry, pomegranate and cranberry flavoured and under 100 calories each. Going wildly off topic here but the trailer is finally out for New Moon, the sequel to Twilight. It was released last night and can be watched on the MTV movies site. I didn't particularly enjoy reading New Moon but have higher hopes for the film. I'm currently lapping up Eclipse.